Everyone is invited to join in the fun on Saturday, March 23rd with the IHA Animal Welfare Tour and Scavenger Hunt! Support our local animal rescue by visiting nine animal welfare locations on the Southwest Side of Cedar Rapids! Meet adoptable animals at each stop and learn more about the great work these organizations are doing in our community by participating in the scavenger hunt for awesome prizes! Proceeds from the day’s events will help fund programs provided by Iowa Humane Alliance (IHA) and their Regional Spay/Neuter Clinic located in Cedar Rapids. IHA’s on-going mission is to reduce companion animal overpopulation and euthanasia as a means of population control in Iowa by providing services such as high-quality, low-cost spay/neuter procedures. After opening in 2013, the IHA Regional Clinic has spayed or neutered over 47,000 owned, shelter and rescue animals as well as community cats, preventing tens of thousands of unwanted animals entering our local shelters and rescues. The “Animal Welfare Tour” event will also help raise support for Spay/Neuter/Adopt and generate awareness for all the hard-working local animal welfare organizations in the area. It’s good for the animals we all love and good for our whole community! Get out and participate in the Animal Welfare Tour and Scavenger Hunt on March 23rd! 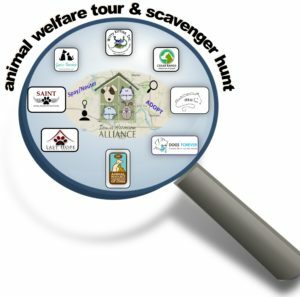 Animal Welfare Tour is open to everyone – FREE! $10 Pre-registration opens here, March 1st! Share the flyer and spread the word! !